Note: this blog post has been originally published on the official Veeam blog. Last year, Veeam released Veeam Cloud Connect, a new technology that allows the easy creation and consumption of offsite backup repositories. It was the first solution specifically designed around Service Providers, both from a technical and business point of view. Its extreme ease of use and capabilities made it an instant success, and as of today several hundreds of service providers are offering offsite backup services based on Cloud Connect. As a first generation technology, everyone was expecting additional capabilities in the following versions, and the most common request has always been “are you going to add replication capabilities?”. As you can guess from the title of this post, that’s exactly what is coming in the next version! Veeam Availability Suite v9 will bring Veeam Cloud Connect Replication, a fast, secure cloud-based disaster recovery (DR) solution. DR is a great solution to increase the availability of modern datacenter, and does so by leveraging replication technologies and creating an off-site replica of virtual machines. When end users want to design and create a DR site, they are facing a problem: the capital expenses of building and maintaining the secondary site. In a second location, owned or rented, they need to deploy new hardware and software according to the size of their production environments, configure it and even manage it, virtually doubling their IT infrastructure efforts. Also, because production workloads are running for the most part within the primary site, the secondary one is rarely used, thus its cost it’s even higher when compared to its value. This is the situation where a cloud-based solution fits perfectly. By renting resources from a service provider on a pay-as-you-go model, end users have the same final result (CPU, ram, storage and networking resources available for failover operations) without any capital costs and the burden of designing and deploying the DR site. Furthermore, VM replication through Veeam Cloud Connect is easy-to-use and simple to set-up, thanks to a simple single port connectivity via a secure, reliable SSL/TLS connection to a service provider. So, there’s no need to set up and maintain VPN connections, or open multiple ports in your customer firewalls. Yes, you heard this right: we encapsulate ALL traffic – replication management traffic, actual VM data transfers and even inter-VM communication during partial failovers – into the single port. The end user, upon subscribing to the service and connecting to a service provider, will see a virtual cloud host, a multi-tenant view of the assigned DR site resources with CPU, RAM, storage and networking resource allocation. Basically, a cloud host serves as the replication target for the replication jobs set up by the end user. Failover will have multiple options. Full site failover will be obviously available, but we worked to add additional innovation: partial site failover. With that, end users will be able to failover to the DR site just a part of their workloads, while other VMs will still be running in the production site. This advanced capability will be available thanks to built-in network extension appliances, that will simplify networking complexity and preserve communication between running VMs regardless of physical location. So unlike other solutions, Veeam Cloud Connect Replication will not only manage data replication, but also the network connections between the two sites. Disaster recovery-as-a-service (DRaaS) is no doubt one of the most requested services by end users. 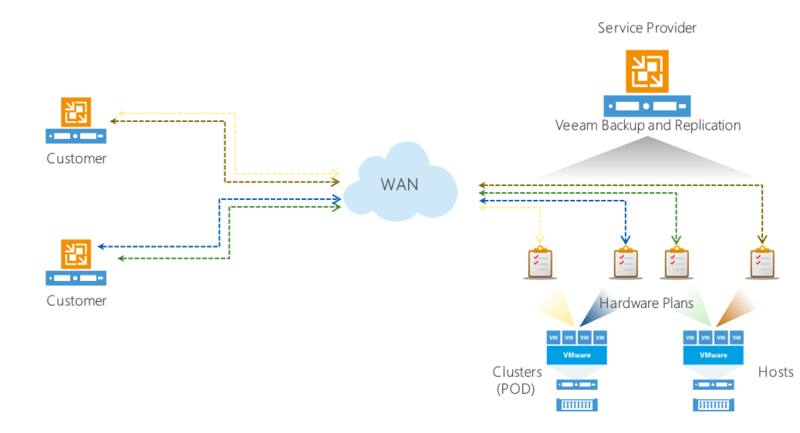 With Veeam Cloud Connect Replication, service providers will have a complete solution to quickly create and deliver DRaaS services for VMware vSphere and Microsoft Hyper-V environments. The software, thanks to its native multi-tenancy capabilities, will allow a complete isolation of end users hosted on the same hardware, as well as built-in network connectivity management for all failover types – all without the need to license, learn and maintain any additional 3rd party software. A great technology is not enough to offer a great service. To create an easy to use and quickly consumable service, especially for something powerful (and complex in the background) like DR, it takes more than just the robust replication and networking technologies. There are a few more essentials pieces, all of which are provided by Veeam Cloud Connect. First, ease of use: once end users register a service provider, they will see the new virtual host added to their B&R. Replicating VMs to the service provider’s infrastructure is as easy as setting up a familiar replication job pointing to this cloud host as the target. And since there is no difference in setting up a replication job, the existing Veeam users do not have to learn anything new! Second, the removal of the biggest pain point of any DR service: networking. The Network Extension appliances preserve communications with and between running replica VMs during full and partial failovers regardless of their location – and even without having to make any changes to replica TCP/IP settings before, during or after failover. Third, bandwidth-friendliness. Seeding, compression, replication from backup, Built-in WAN Acceleration are all provided as a part of Cloud Connect Replication to allow customers with slow or unreliable WAN connections, or large amounts of data, to protect their workloads with RPOs that was never before possible with their available bandwidth. Finally, self-service. This is critical to any cloud service, and Veeam Cloud Connect is not an exception. This is why we will offer a web portal, running at the service provider and accessible to the end user from any device and from any location. Using this portal, the end user will be able to login and start any failover plan on their own, without requiring any intervention from the service provider. This exciting new technology will be available in Veeam Availability Suite v9, coming in Q3 this year. I can’t wait to be able to talk more about it and show it once the GA date will be near: expect lots of content on this topic in the coming months.